A native Midwesterner, Dr. Erik Ray joins us from a highly specialized interventional radiology background. He served as an assistant professor in the department of body imaging and vascular and interventional radiology at the University of Washington and also was part of a high volume interventional radiology practice in a community setting. As part of a growing interventional radiology team at Radiology Associates of Appleton, Dr. Ray maintains the highest clinical standards for the care of patients. Dr. Erik Ray earned his bachelor’s degree in Anthropology with distinction at University of Wisconsin-Madison. He received his medical degree from Chicago Medical School. He completed internship and diagnostic radiology residency at Rush University Medical Center in Chicago where he served as chief resident. 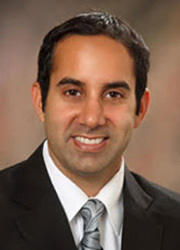 He received additional fellowship training in Interventional Radiology at Johns Hopkins Medical Center and also in MRI at Rush University Medical Center. He is a member of the American College of Radiology, Radiologic Society of North America and the Society of Interventional Radiology. Dr Ray is board certified by the American Board of Radiology, with a certificate of additional qualification in Interventional Radiology.